How much more hardship can be felt by those already poor? They're already hurting... and sacrificing... for an unjust system. Admit it... you're concerned for possibility of economic hardship of Establishment leaders, yes? I celebrate and recognize the importance of differences and diversity. Understand though that that doesn't mean I don't think you specifically a chucklehead. People gathering —even gathering en masse— to protest elitist plutocrats is not a mob. It is a right. You'd think a U.S. Senator would know this. McConnell continues to prove himself subpar. Violence is being done. It's disguised: Unjust policy is used in lieu of physical abuse. It too harms and scars. People being attacked have a right to defend themselves. Peace can only be preferred, not assured. It is commitment, renewed. Doing away with guns ain't going to disappear the frustration, resentment, & fear (etc) plaguing the USA. You may not want to listen, USA, but your values, strategies & policies are diseased. And it's now infected culture—so no quick fix. The GOP has no desire (nor skillset & values) to develop a robust healthcare system and I don't think ACA is an effective solution. Universal Healthcare, not today but yesterday. My mind & ears are deaf to your virtue signaling if you're a Team Blue Verified member who felt entitled to Tweet snippets of a private convo between strangers overheard while at a coffee shop. Your fave Team Blue Verified member ignores your interests & pleas after 'their side' wins and they wield power—as they did during Obama terms. They'll again coast on your money & attentions. You'll remain broke(n). FOR SALE: Baby's shoes (from DIRTY DANCING), never worn. 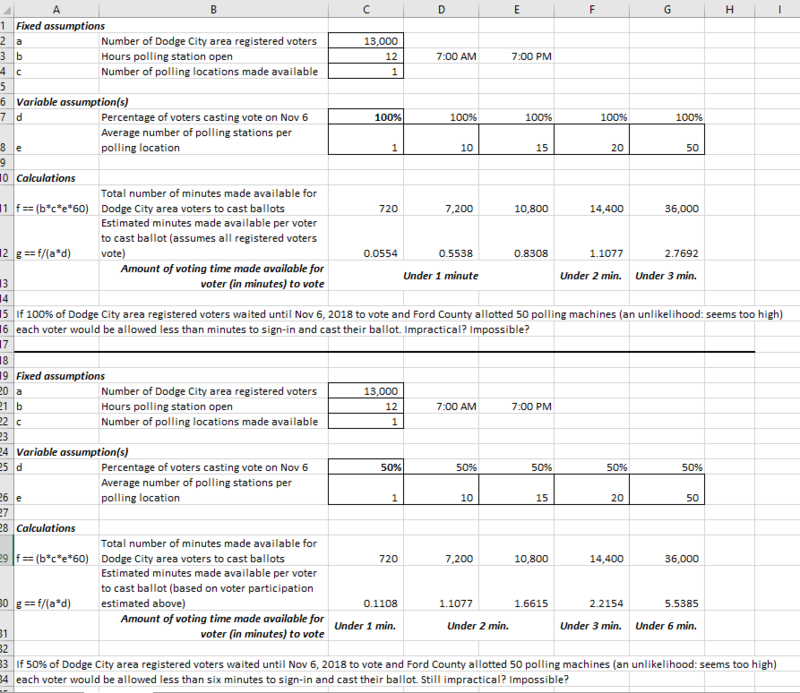 Inspired to better understand voter issues and voting implications happening in Dodge City, KS and elsewhere I'm spending time with tea and spreadsheets this morning (22-Oct-2018) and looking at whys and what-ifs regarding voting capacity, throughput and constraints. After I stress test the model for various assumptions and determine if it possesses some degree of helpfulness, it can be made available to ACLU KS... and likely will be.